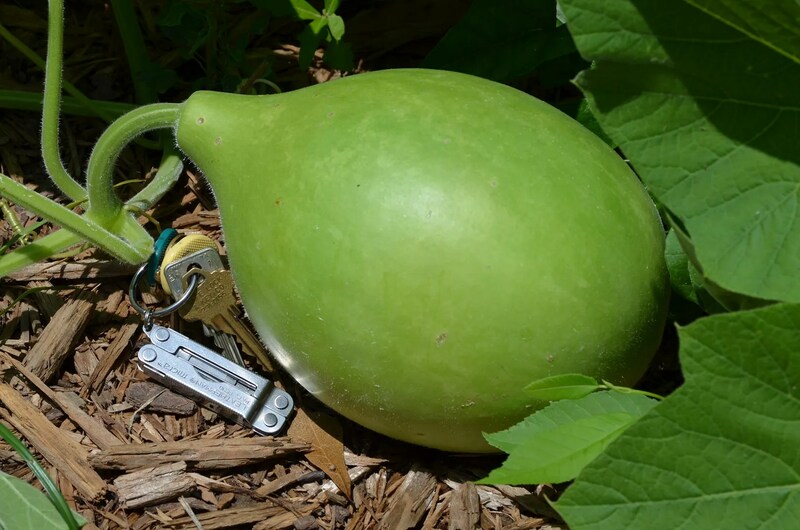 If you’ve followed this silly blog for a while you probably already know that I am afflicted with a modest case of gourd infatuation. From May through July the vines grow, slowly at first but then seem to double every other day as August approaches. 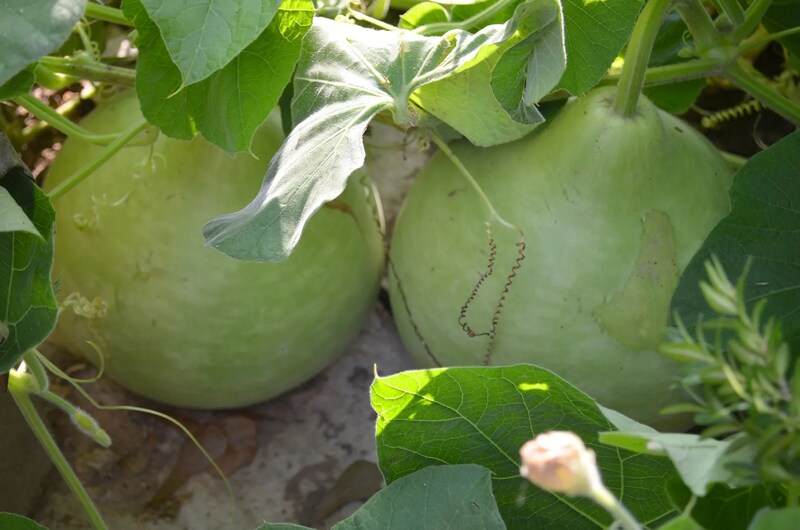 The blooms appear for a few weeks without a gourd setting since initially all of them are male. 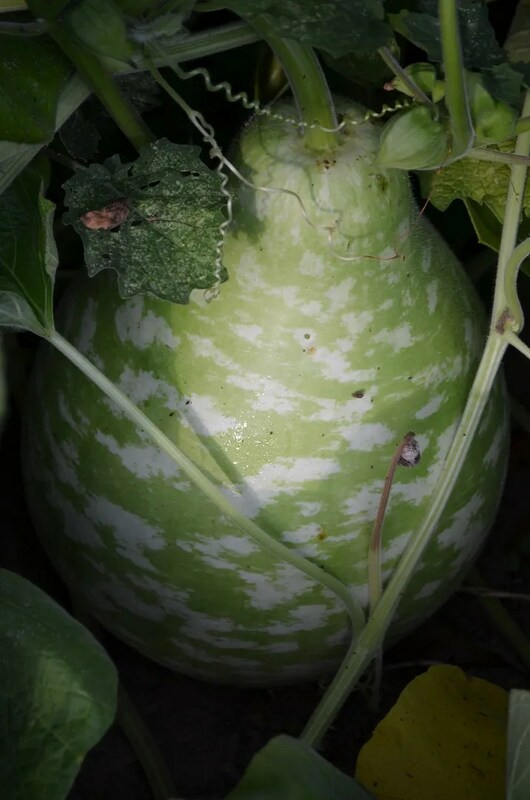 As august rolls in, so do the female blooms (on the side growth off the main vines) and eventually you spot a gourd or two taking hold. 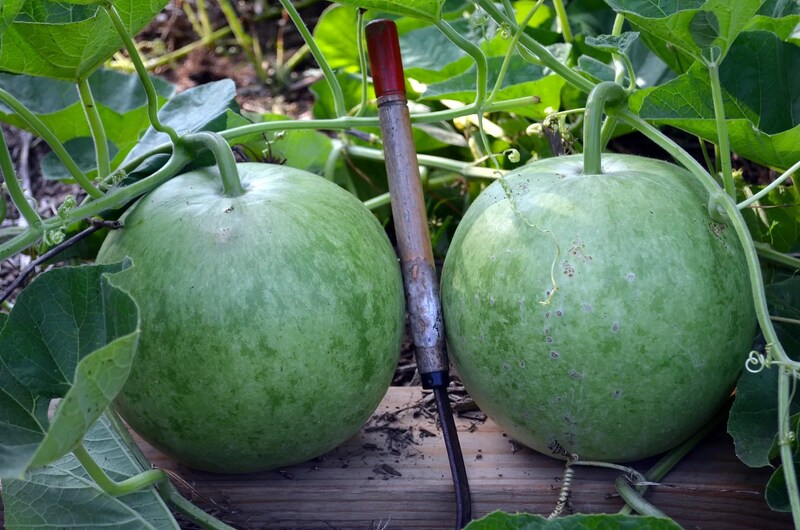 Three samples follow; typically they are slightly elongated but as you can see one is more spherical. 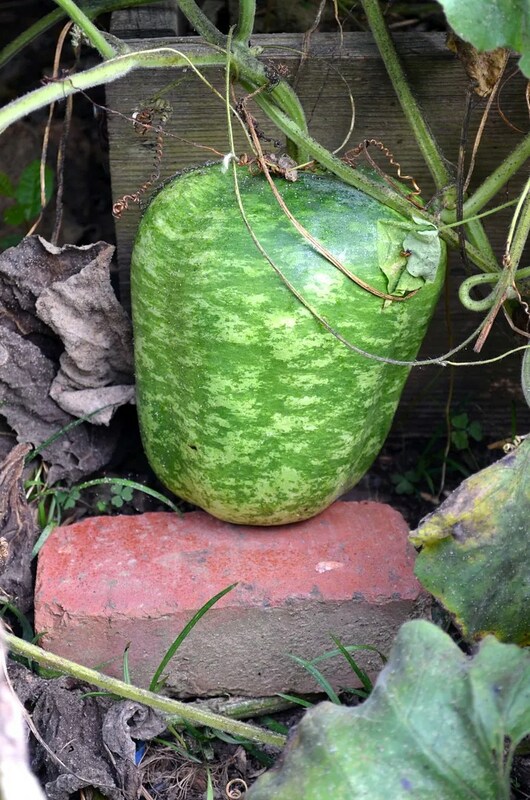 For scale, compare the size of the last one to the brick it rests upon. 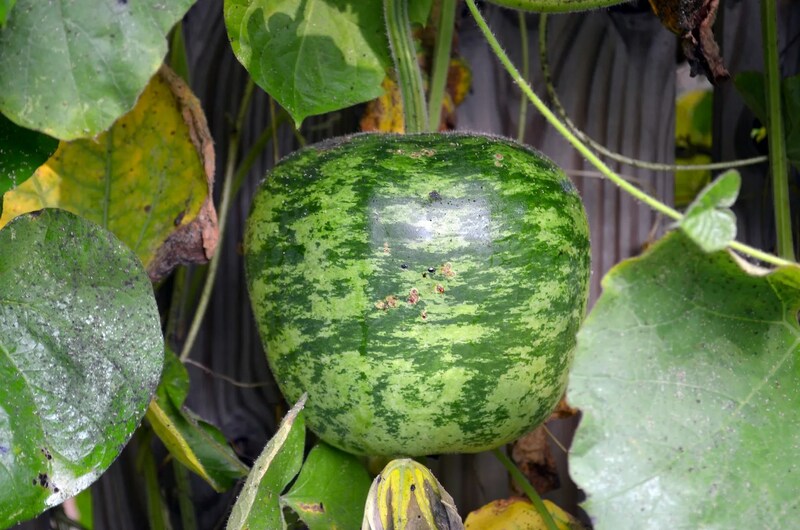 The big news this season (big to me of course, but it only garners an eye roll from Mrs cohutt) is that after 3 years of trying I finally got some “bushel basket” gourd seeds to germinate. These are planted between the middle boxwood garden and the back beds. Actually, that’s where they started; now they are over my neighbor’s fence, in the boxwood garden, surrounding the bell and unsuccessfully (for now) trying to get a toe-hold into the blackberry trellis. My hope was that the vines would serve as an effective weed suppressing ground cover with all the new morning sun hitting that back section; they have accomplished this but every other day I have snip their coiled tendrils off of the boxwoods and tomato cages and redirect them in order to avoid being completely overrun. These are interesting (just ask mrs cohutt -not!) 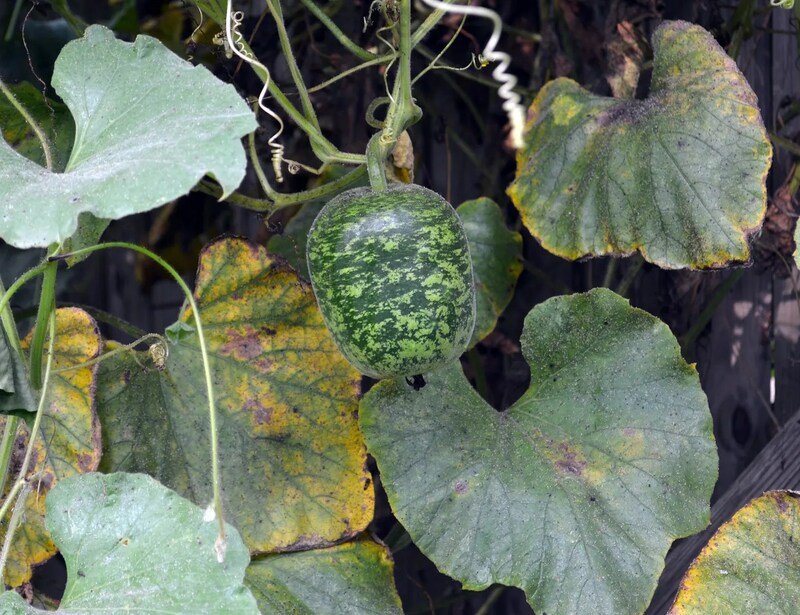 and scattered throughout the mass of vines I continue to discover gourds lurking underneath that are already 8″ to over 1′ on diameter. I am afraid that Mrs cohutt remains unimpressed, but just wait until she sees the uber-awesome things we can make with these fine gourds, like these gourd lamps on display somewhere in Mexico. Ah Bruce, your prose never disappoints. Nice writing and nice photography. 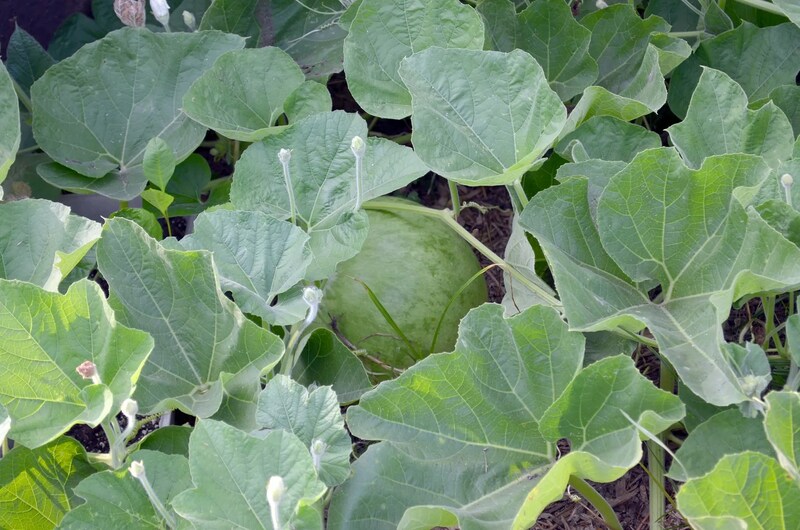 In Prince Edward Island, my Minnesota MIdget Cantaloupes are .showing up, among the cucumbers. 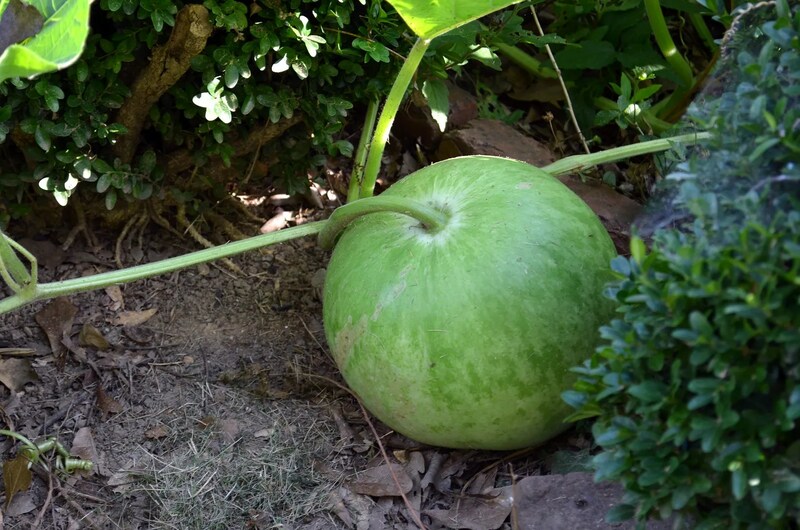 Alas the BlackTail watermelon just does not have enough days at 46N to get to sufficient size. Golden midget do well up here. I just planted my fall “Scarlet Kale” and Napoli Carrots for early winter harvest. Keep up the great posts! Thanks Brent.. sometimes I get a little tired of the degree and duration of our summer down here and your comments remind me that it allows for a diverse and productive growing season that I should be really grateful to enjoy.